Two people who are extremely comfortable with each other at a news conference at the Mar-A-Lago Club, Friday, March 11, 2016, in Palm Beach, FL. Photo via AP. 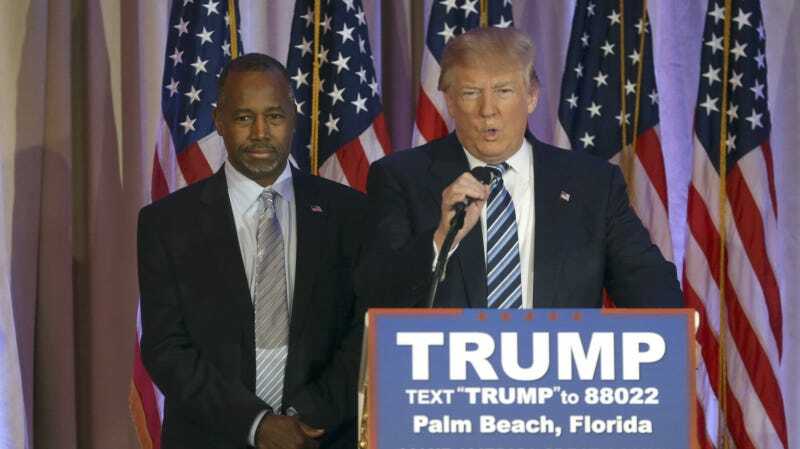 Buckle the hell up: Donald Trump and Ben Carson, two men stuck making strained conversation in the deserted waiting room of a Jiffy Lube, will be campaigning together. Specifically, they’ll be hitting community spots in black and Latino neighborhoods, after Trump described those neighborhoods as “war zones” where everybody is always getting shot. Mr. Trump continued his appeal to black voters on Friday at a rally outside of Lansing, Mich. In a county that is 88% white, Mr. Trump said African-Americans have “nothing to lose” by supporting him, because their plight in America’s Democratic-run inner cities is so dismal. Former and/or current Trump employee Corey Lewandowski defended Trump’s refusal to visit black people where they actually live, telling CNN you can’t possibly expect him to go to those dangerous places. You know what’s amazing to me is that no one remembers Donald Trump went to go have a rally in Chicago at the university. And do you remember what happened? It was so chaotic and it was so out-of-control that the Secret Service and the Chicago Police Department told him you could not get in and out of the facility safely. And that rally was cancelled. And you’ve shown the footage many times of the individuals that attended that rally. But anyway, now all that is in the past: the Washington Post reports that Trump and Carson are hitting the streets to visit community centers and churches in black and Latino neighborhoods, including a planned tour of Detroit, where Carson grew up. Trump will also be relying on a cast of “black surrogates,” as the WaPo puts it, to make his extremely not-racist case. That means the return of Diamond and Silk, two of the presumably tens of black voters who are lining up to support Trump. It’s hard to see what could go wrong here! Or, anyway, more wrong.